DokuBaku Film Festival opened in Landmark on October 12. The idea of the first ever international documentary film festival in Azerbaijan came from director Imam Hasanov and producer Veronika Janatkova. The theme of this year’s festival is “Testing the Reality”. In his speech, Imam Hasanov stressed that the festival aims to encourage Azerbaijani filmmakers to create documentary films and participate in festivals. The audience will be presented 15 domestic films and 17 foreign films from Germany, Italy, Russia, the Czech Republic and other countries. Film screenings will take place in cinema halls and cafes around Baku. 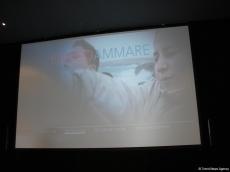 At the opening day of the festival the viewers watched a film "Fire at Sea" (2016) by Italian director Gianfranco Rosi. The documentary drama is about of refugees from African countries who for decades illegally migrate to Europe. Following the film screening, a colorful concert was held for event participants. The festival also consists of main and competition programs. DokuBaku is being held in parallel with IMAGINE Euro Tolerance Festival which takes place on October 12-20.